Here’s a little quick trade that I’m looking at! A few hours ago the euro took a bit of a hit against the dollar when poor business activity in France and the whole euro region eclipsed the fact that Germany’s services PMI printed at its fastest rate in three years. 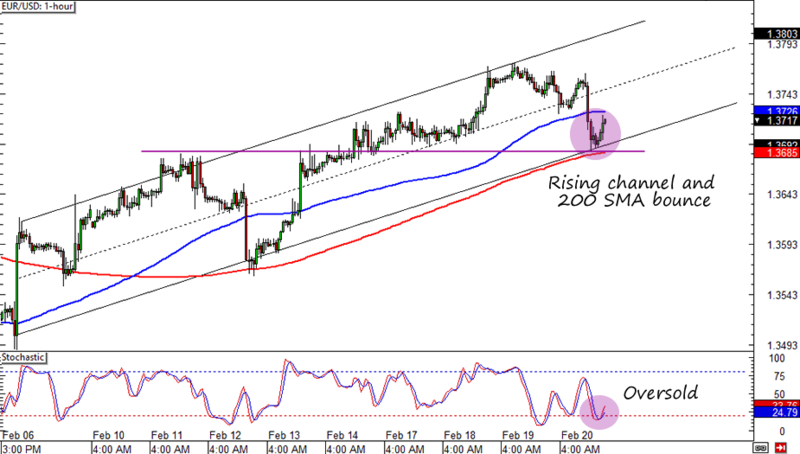 On a technical basis EUR/USD had just bounced from a support area near a rising channel support and this week’s open and last week’s highs. Not only that, but it’s also near an area of interest on the 1-hour chart. I’m going to see if this bounce will make it all the way to the top weekly ATR near the 1.3800 and yesterday high levels. I risked 0.25% at 1.3721 on this one and placed a 50-pip stop and an 80-pip target. I’m planning to hold this trade as long as the channel is intact or until there’s a strong US data that could threaten the uptrend. Maybe US Philly Fed index report? In any case, I’ll be watching this one closely. What do you think? Is this a valid trade idea?